At the insistence of Pie Diva, a couple of weeks ago a few Contingent members met at Elias Inn Supper Club in Watertown, WI for Friday fish. We had to wait awhile for a table for 8; during that time Buddy Roadhouse and MilwFoodLovers took a quick trip to Glenn's Market to stock up on a few things while the rest of us waited in the bar. At Elias Inn there is no menu service on Friday. 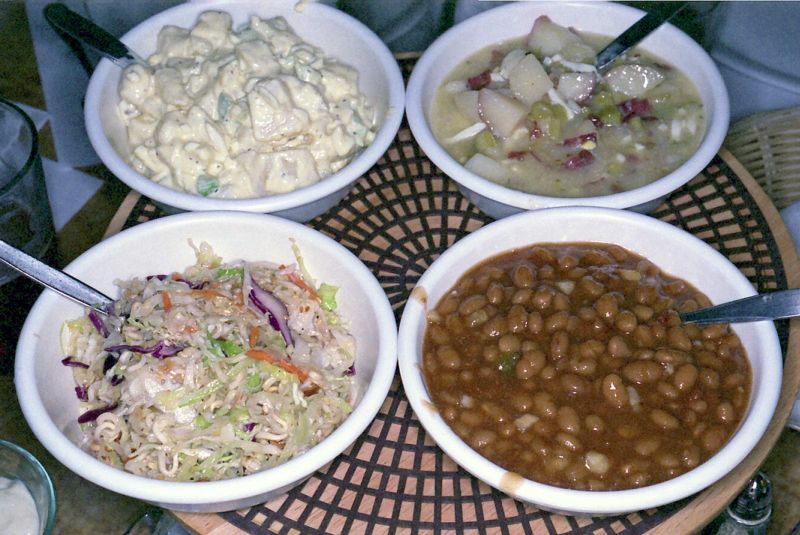 Everything is served family style for one fixed price and is all-you-care-to-eat, and starts with a lazy susan of 4 sides: American potato salad, German potato salad, baked beans, and an Asian-style slaw (clockwise from top left). 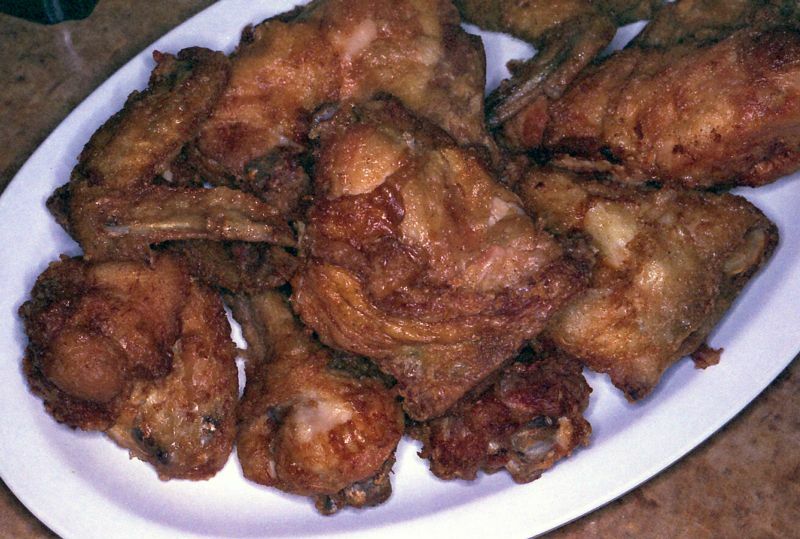 There are 3 proteins: fried cod, baked cod, and fried chicken. After we cleared the plates we reordered fried cod and chicken. At the time we were all so terrified of Pie Diva that we agreed that it was very good just so we could get out of there alive, but now the truth can be told: it was very good. I liked all three entrees (OK, maybe I was just a little partial to the chicken) as well as the baked beans, although the German potato salad was a little on the sweet side (I like mine mostly savory). I'd definitely return for the fish fry but on other nights Elias serves a German/American menu, which would be worth looking into sometime. 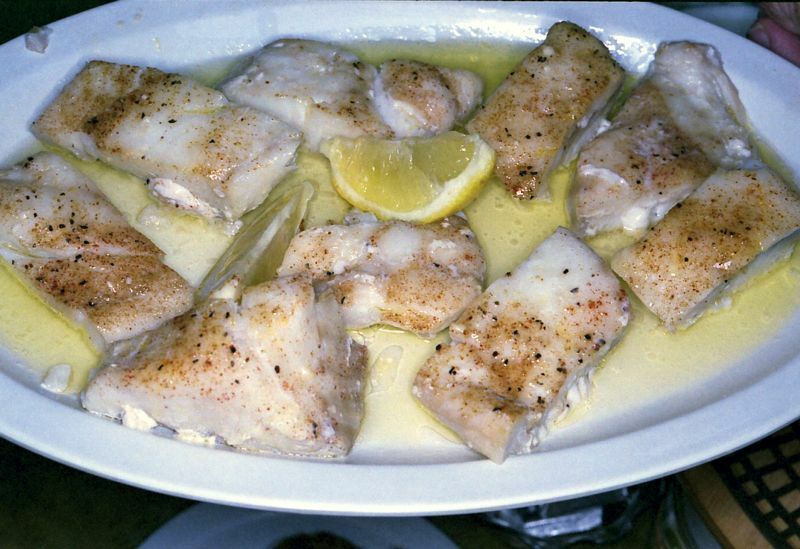 I too was impressed with the fish and chicken; baked cod was surprisingly good, given that we were at a fish FRY. The weakest link on the table (even Pie Diva agreed) were the French fries which were a common institutional variety. However, the German potato salad was obviously house made and quite excellent. I had a wonderful meal by focusing on the fish and chicken along with replenished sides of the potato salad. Elias Inn's regular weekday menu does sound intriguing. Definitely worth a revisit to try the German specialties. A quick stop at Kopp's for Frozen Custard on the way home capped off a great evening. Thanks to Pie Diva for insisting we check out Elias Inn. Good pick! Next up, Stolley's Hogg Alley! The end of October is wide open for us. This thread might need to be re-titled "Wisconsin Friday Fish Fry, A Collection". I will be in NC until after that date. How about November? Won't know November until we get much closer to that time. Of course, if we set a date now, I can always request that day off. Maybe propose a couple of Fridays for the group and see who responds. I mentioned that a visit to an iconic Wisconsin supper club, The Hob Nob, might make a nice road trip. Situated between Racine and Kenosha on Lake Michigan it certainly has the visual appeal of long gone era. HobNob is featured in the WPT show Supper Clubs 101. The Hob Nob is still open? Looks like we've got two outings to schedule over the next 6-8 weeks. Stolley's Hogg Alley and The HobNob both look like worthwhile reasons for Flatlanders to break through the Cheddar Curtain. Do we need a Doodle Poll to figure out dates? I ate at The Hob Nob eons ago.....was great back then! 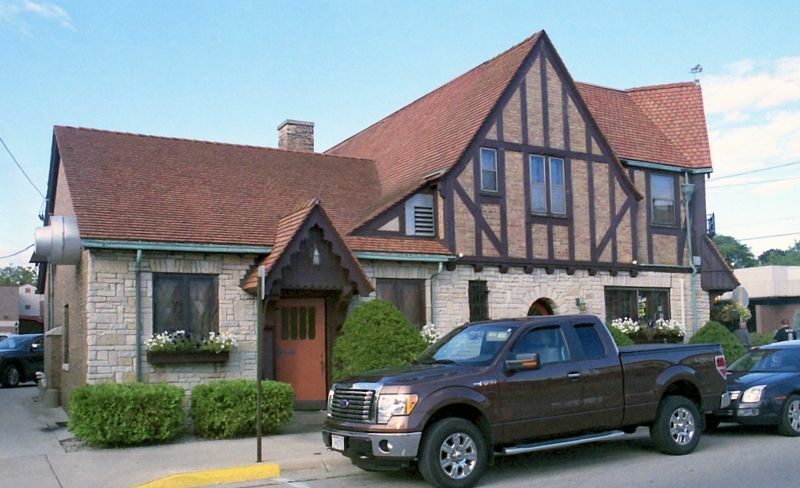 And has anyone else eaten at The Corner House in Racine? Another great supper club with great food! Good job renaming the thread ChickenDude. Now let's make the tour (over time, not all in one day) happen. We've got two, maybe three places nominated. Let's pick some dates! Even though it's not a supper club, Pie Diva has already nominated Hogg Alley for fish so maybe we should knock that off the list first. Also, do we want to try to alternate between fish (Fridays) and beef (Saturdays), or instead pick a place and go with its strength? Yikes, this is turning into an intellectual exercise. Nobody told me there'd be thinking involved. This is Cheesehead territory. I trust the locals to pick the spot and tell me when and where to show up. I agree we need to make Hogg Alley a definite destination. However, she has indicated she isn't available until November for that outing. How about we hit one of the other suggestions in October and save Hogg Alley until the Pfeff Clan is back where they belong. 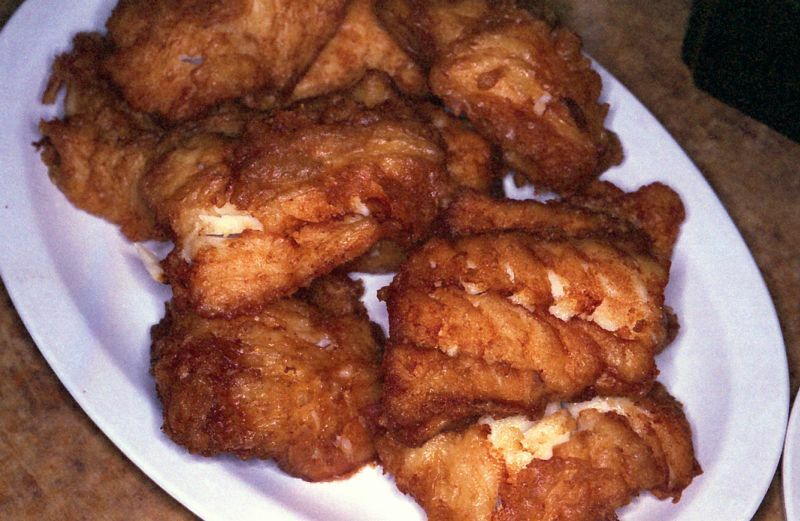 My impression is that HobNob is not necessarily a Fish Fry destination and could be done any night of the week when the group is available. Likewise The Corner House in Racine. We've already got our Apple Picking excursion set for Sunday,October 4th. The last two weeks of October look pretty open for us. Any interest? Sunday-Thursday is usually out for us if each-way travel time is likely to exceed 45 minutes but weekends are a lot more flexible. So far late October looks pretty good (things are heating up at work so that could change) but if JR and the Diva will be back in November I'm fine with waiting so that they don't miss out. & all weekends in November. You'll be back from Detroit by 11/27? It is certainly possible my leg may be healed enough for a short outing in late October. I certainty hope so, I'm sick of missing these things. I won't be able to commit to any date and won't know until it gets closer if I'm up for it. I'll be watching this thread. Had to check my calendar before responding here. Saturday and Sunday October 17th & 18th both look good for a Supper Club field trip (obviously not Fish Fry). How about HobNob or The Corner House in Racine? Who's available? As of now, November is wide open for whatever. All in for Hob Nob. 17th or 18th? Let's pick one and send around a PM for the Contingencies who aren't paying attention. As of right now Saturday the 17th works for me, especially if we get there when service starts at 5pm. As a bonus, HobNob accepts reservations. 17th. Can we strap Ann to the roof of the car if it isn't deer season? Jim, don't you have a copy of Wisconsin Supper Clubs? We should use it as a guide. I'll throw one out for next summer, since it might take that long to save up the necessary cash: Ishnala. But only if it's in the book. I don't have that one. It is kind of pricey. Probably 3 or 4 Old Fashioned's for that price. We like Cimaroli's, also near the Dells.